It has become evident that the play, The King in Yellow, is somehow cursed. But how it’s cursed? That’s harder to explain. Until that explanation is offered, however, you have very little that you can bring to any authority. Your early investigations have left you certain that there’s something terrible somehow connected to the play, but who would believe you? Who would believe that evil Omens could follow a theater performance from city to city? Or that it could leave a trail of disappearances, suicides, delusions, and insanity in its wake? The very idea must almost strike you as madness, and you may, at times, doubt even your own sanity. 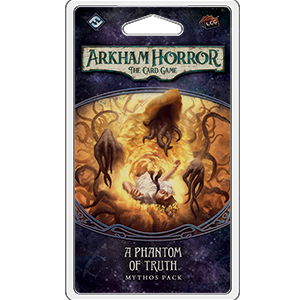 But the things you’ve seen cannot be unseen, and as is so often the case in Arkham Horror: The Card Game, you find yourself compelled to dig deeper for the truth. It’s late. The sun has set, and the night is dark—cold, misty, and starless. But when you arrive at the Historical Society, you find the front doors cracked halfway open. Someone has come here ahead of you, but who? In Echoes of the Past, you and your friends will find you’re not the only one looking for information about The King in Yellow. 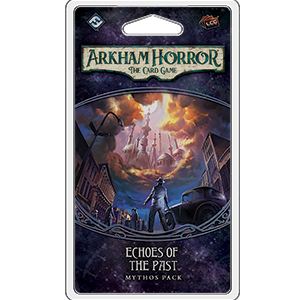 A number of Cultists have secretly made their way to the Arkham Historical Society, and they don’t seem interested in sharing whatever they find. You don’t know whether they’re hoping to uncover the play’s secrets or if they’re working to bury the information forever—but one thing is certain. You need to look quickly for your answers, or you’ll never get your hands on them. 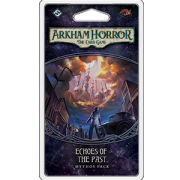 Accordingly, Echoes of the Past throws you headlong into a desperate race for information, and it introduces unique, scenario-specific mechanics that pit your skills as investigators directly against those of the Cultists who are conducting a search of their own. 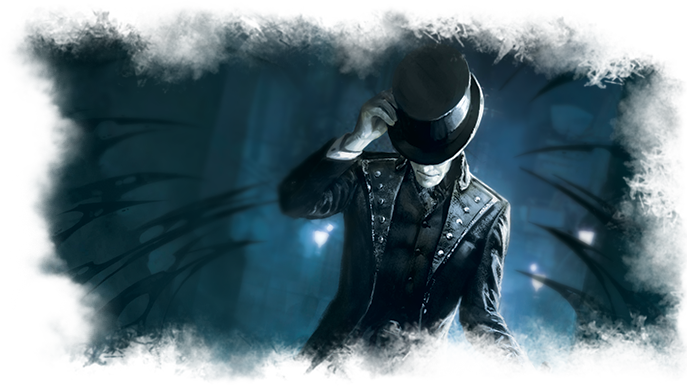 Typically, in the Arkham LCG®, the agenda ticks forward steadily—with a seeming inevitably—as the forces of the mythos advance their schemes with only the rare surge. You place one doom on the agenda at the beginning of each Mythos phase, and every now and again, you’ll encounter a treachery or enemy that accelerates the agenda by adding another doom or two. Still, the effect is one that puts you on a timer, but it generally feels measured. In fact, if you’re efficient enough with your investigation, you may not even feel the first pangs of dread settling in before you uncover all the clues you can. Sure, you might be treading a razor’s edge with the time you have allotted, but it’s a razor’s edge you understand. Echoes of the Past throws out that steady, measured bleeding of doom in favor of a new sort of chaos. 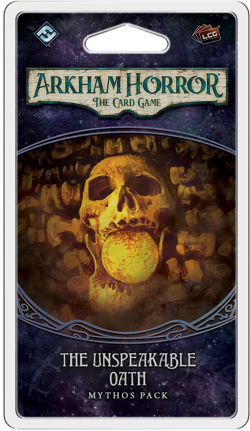 A panicky, paranoid, “what will the encounter deck reveal next?” sort of chaos. Your doom won’t march forward at any predetermined pace; instead, it will collect doom in fits and starts as you come across enemies like the Seeker of Carcosa (Echoes of the Past, 144) as they dart the Society’s different rooms and hallways. This new mechanic does a couple of things in the scenario. It allows you to play with an agenda deck that can advance in a single round—or not at all. It demands that you deal swiftly with all of the Cultists you encounter in order to prevent them from collecting doom. And it personalizes the effort—no longer are the forces of the mythos proceeding apace somewhere in the hazy distance; they’re in your room, or down the hallway, or scuffing furniture and bookshelves along the floors above you! In the meantime, you can rest assured that the scenario is still going to force you to make the most of every action. After all, each agenda step offers only a very narrow margin for error. And, in the end, if the Cultists find their clues before you? It’s not clear exactly what the changes will mean, but your whole campaign will shift. 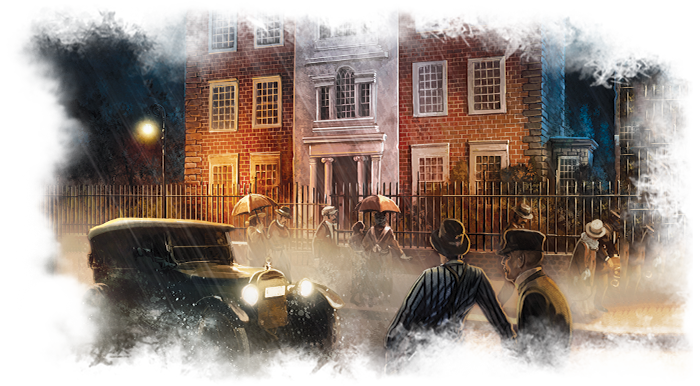 What will you find during your search of the Arkham Historical Society? Will you uncover any books that may lead to the truth behind The King in Yellow? Will you be upstaged by masked Cultists? 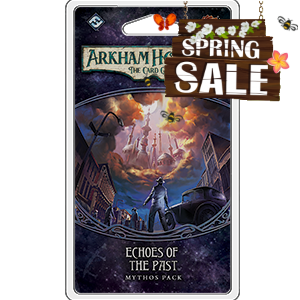 Or will your discoveries lead you further down the slippery slope to madness, tempting you forward into delusion with tainted relics like The Tattered Cloak (Echoes of the Past, 143)? 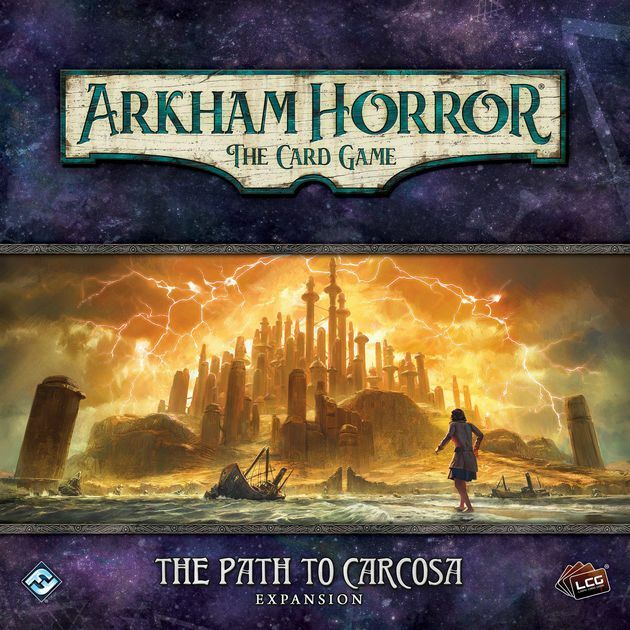 Fantasy Flight Games is proud to announce the upcoming release of The Unspeakable Oath, the second Mythos Pack in The Path to Carcosa cycle for Arkham Horror: The Card Game! It was always going to come to this… You’re finally headed to the asylum. Something about the mysterious play, The King in Yellow, had nagged at the corners of your mind before it arrived in Arkham, and you began investigating. You learned madness and disaster followed the play everywhere it went. And still you dug deeper. Now, as you look to carry forward through The Path to Carcosa campaign, you may find yourself wracked by Doubtand surrounded by Lunatics. And, still, you’ll catch hints of deeper and darker secrets. 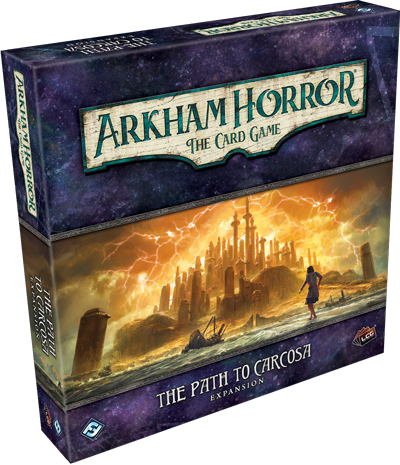 With the new scenario coming in The Unspeakable Oath, Arkham Horror: The Card Game continues and deepens its exploration of the mystical realms between the traditional roleplaying and card game experiences. First of all, you have the strong sense of place that’s exceedingly rare among card games. 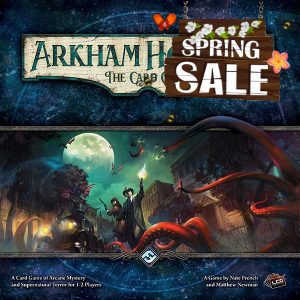 You’re not wandering the streets of Arkham, nor the wooded New England hillsides. Instead, you’re wandering the hallways of an eerily quiet asylum—perhaps punctuated, at times, by mournful howls or manic laughter—and need to gain passage through several locked doors. 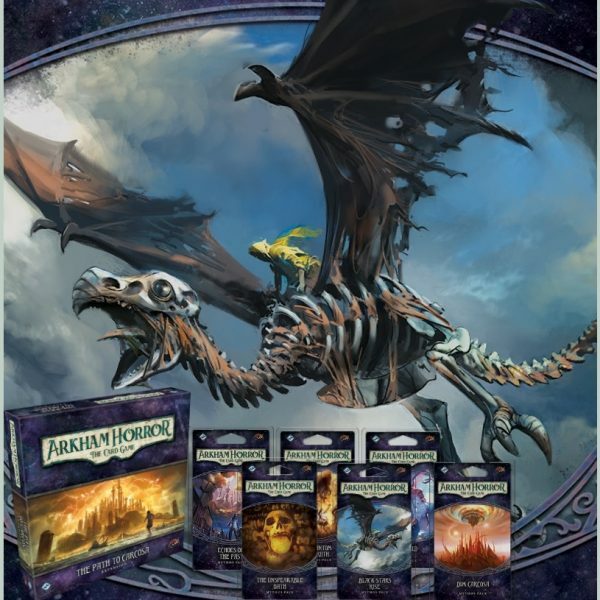 The fact that doors can be locked against you is important in the sense that it allows the adventure to unfold at the same sort of pace with which a Game Master might walk you through an adventure. And it matters because you can only act upon objects and information in your investigator’s location. Moreover, if you and your fellow investigators split your company, you might cover more ground… or you might render yourselves vulnerable. Next, you have the different ways the scenario preys upon the game’s cooperative nature and the relationships you try to maintain with your fellow investigators. 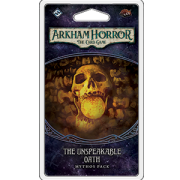 After The Path to Carcosa introduced the Hidden keyword, which forces you to hold cards in your hand—and keep them hidden from the other investigators—The Unspeakable Oath adds more of these cards, so that your experience of the game might not match that of the other players. And none of them will understand you. Your secrets will isolate you from your companions. In the depths of an asylum. Finally, the scenario breaks away from the traditional customizable card game experience by forcing you to live with the consequences of other games. Yes, you can play and enjoy The Unspeakable Oath as a standalone adventure, but for those who dare to look more deeply, The Unspeakable Oath comes to life most fully as part of The Path to Carcosa campaign. It is, in fact, the fourth chapter in that campaign, and it represents the nexus of many possible paths through time and space. But those paths are not all equal. Normally, when you sit at your table to play a customizable card game, you start fresh. There’s nothing imposing itself upon your starting hand or the resources with which you might start the game. 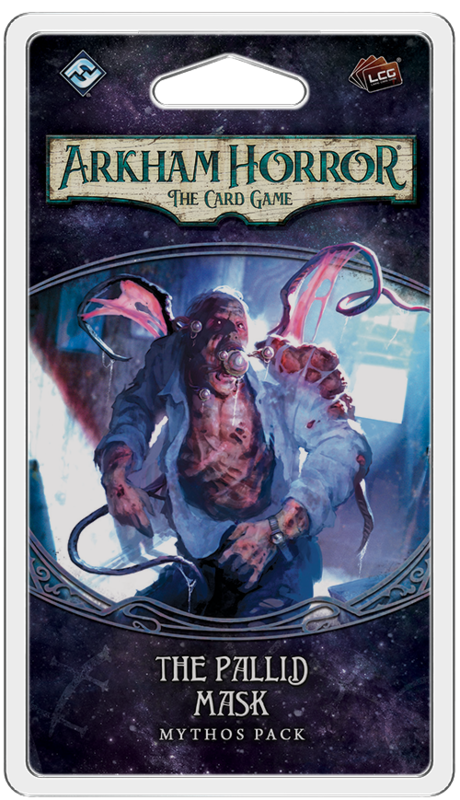 But in the Arkham LCG®, the choices you make in earlier adventures may come back to haunt you later on. The game’s basic structure is the campaign, as in an RPG, and you are often given choices to make in your games—and between them—that aren’t clearly about winning or losing, but just about how your investigator would respond to a given situation. And in The Unspeakable Oath, these choices already come back with profound ramifications, literally restructuring the adventure depending upon the consequences of your earlier investigations. 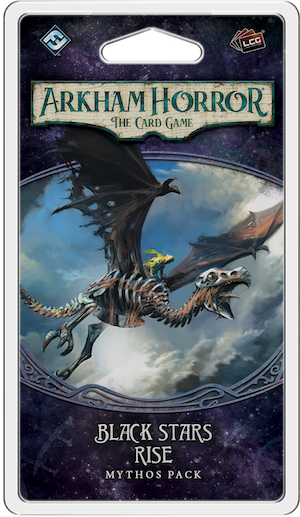 Choices you make in your games—the people to whom you choose to speak and the ways you interact with powerful artifacts—will impact the structure of the adventure’s act deck, as well as the composition of its encounter deck. Along with its new scenario, The Unspeakable Oath introduces twenty-four new player cards (two copies each of twelve different player cards) that allow you to “learn” from your mistakes. 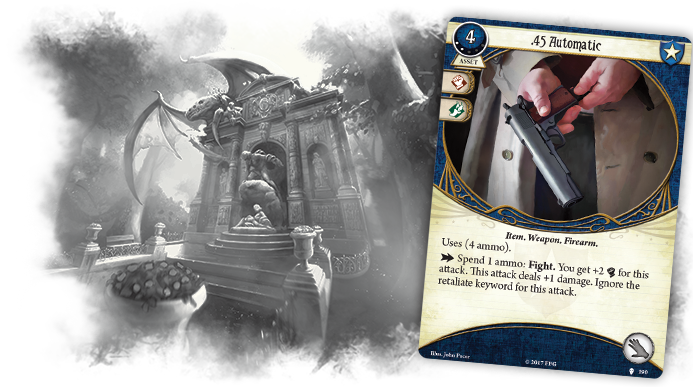 As you gain experience, you can use that experience to enhance your deck with cards like Forewarned (The Unspeakable Oath, 150) and A Test of Will (The Unspeakable Oath, 156). Alternatively, you may forge an alliance with one of the Mythos Pack’s new Patrons, Charles Ross, Esq. (The Unspeakable Oath, 149) and Dario El-Amin (The Unspeakable Oath, 151). Naturally, as Patrons, both of these gentlemen come with valuable connections. Charles Ross, Esq. helps you gain access to a whole host of powerful Items, reducing their costs by one each time he exhausts. You can think of him as your personal connection to the Disc of Itzamna (Core Set, 41), making it easier to afford and discard—and then to afford again. While your investigator has a limited number of body slots to which these Items can be assigned, meaning there’s a limit on the total financial benefit you can derive from recruiting the services of Charles Ross, Esq., it’s worth noting that that limit is a great deal less restrictive than it might first appear. First of all, there’s the fact that you might choose to discard one Item in favor of another—or just because discarding it is in your best interests. Many of the game’s most powerful Items, like the Disc of Itzamna, are discarded when you use them, and Charles Ross, Esq. lends significant value if you intend to use these items over and over—such as you might if you’re playing Rex Murphy (The Dunwich Legacy, 2) with Scavenging (Core Set, 73). 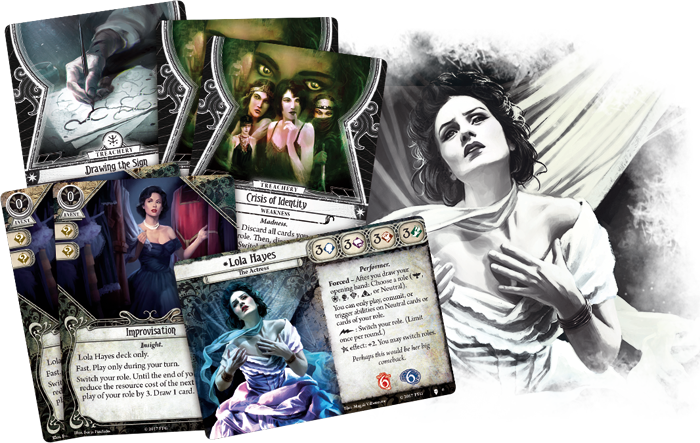 Perhaps more importantly, there’s the fact that the Arkham LCG can support as many as four players, and Charles Ross, Esq. works with any investigator at your location, not just yours. If you and your teammates can coordinate your purchases, Charles Ross, Esq. can easily save your group at least one resource each and every round. Meanwhile, the unscrupulous Dario El-Amin can provide you access to an astonishing array of benefits, all of which should certainly help you find your way out of the asylum. 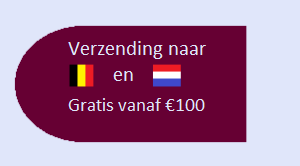 As a single action, Dario El-Amin allows you to claim two resources. He’s also more than willing to offer bonuses to both your Willpower and your Intellect—provided you can meet his demands. Dario El-Amin may be a Patron of the arts, but it’s clear that he’s looking less to prop up struggling artists than to invest in characters and endeavors with records of proven success. The permanent attribute boosts that Dario El-Amin can provide are fantastically valuable, but the Patron requires you to sit on a stockpile of no fewer than ten resources if you want those bonuses. 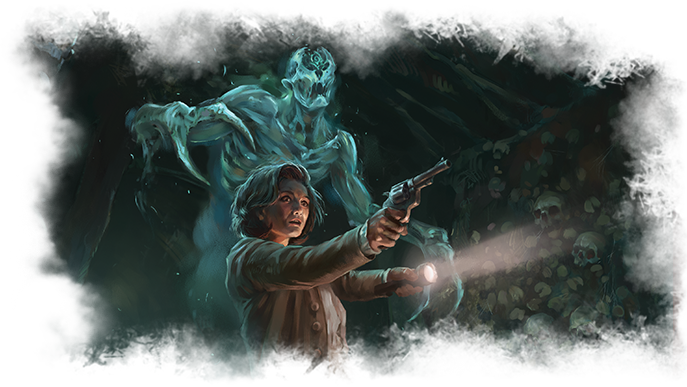 Fortunately, that’s not too much of a problem for Rogue investigators like Jenny Barnes (The Dunwich Horror, 3), who can gain resources fast with cards like Burglary (Core Set, 45), Hot Streak (Core Set, 57), and Lone Wolf (Blood on the Altar, 188). And once you have all those resources at your disposal, it’ll be good to know that Dario El-Amin will be, at least, a little invested in seeing you make your way out of the asylum. 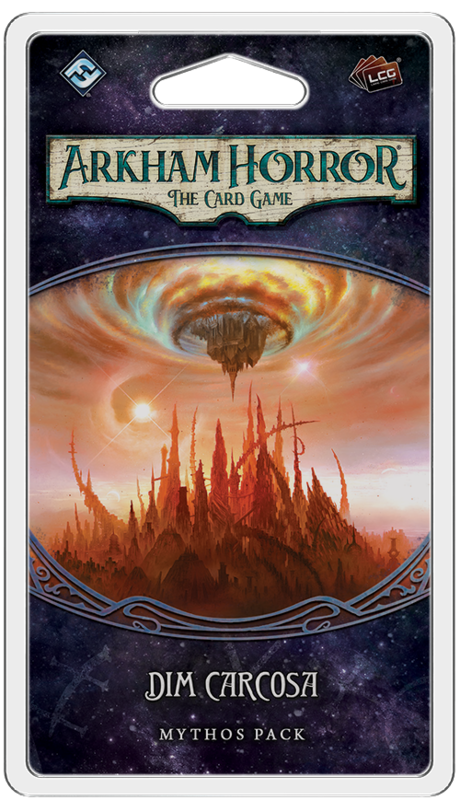 It’s a good thing that Arkham Horror: The Card Game isn’t real life. We don’t really want to stare down unspeakable horrors, suffer grievous internal injuries, and feel our minds fracturing with the burden of all we’ve witnessed. But it makes for great fiction. 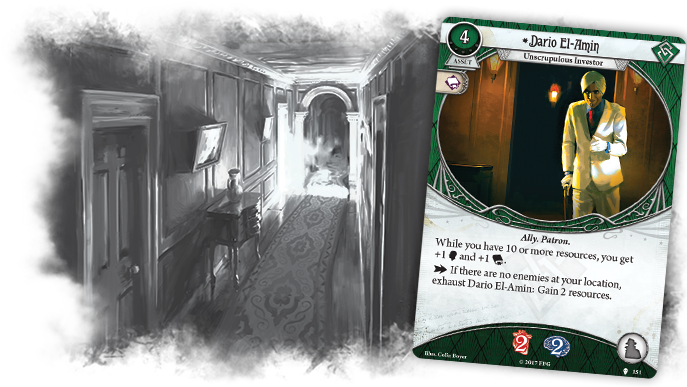 And in the Arkham LCG, it makes for great adventure. Soon, you’ll have your chance to enjoy yet another of these horrifying adventures. In The Unspeakable Oath, you’ll find the world closing around you. You’ll be stuck in the asylum. Surrounded by Lunatics. 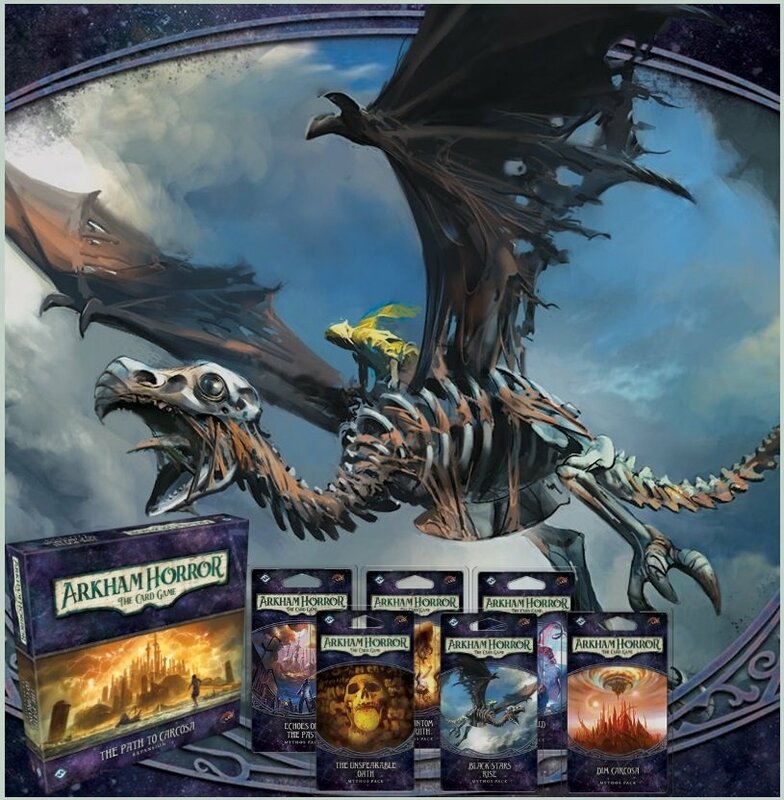 Threatened by monsters and madness… And your games couldn’t be better! This is why you head to Paris; you hope to gain some answers from the play’s director, Nigel Engram. 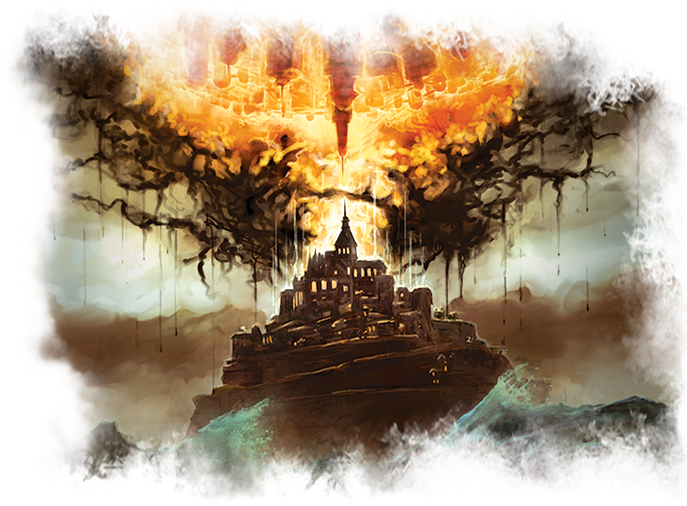 As we mentioned in our announcement of The Path to Carcosa, your investigations into The King in Yellow will eventually lead you into the sort of madness and confusion that force you to wonder what’s reality and what’s delusion. You may even find yourself wondering if the definitions of madness and sanity are as clear as you previously thought. 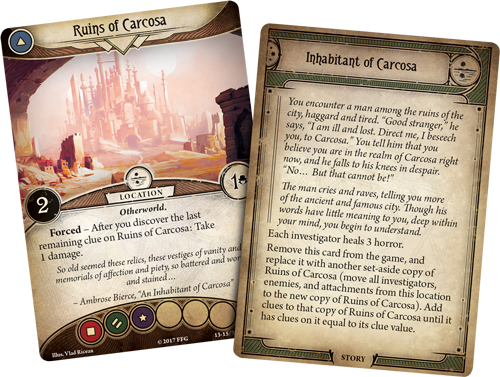 With that in mind, The Path to Carcosa campaign makes use of the new mechanics for Doubt and Conviction that we previewed in “A Mind Is a Terrible Thing to Lose,” our look at the new scenarios from The Path to Carcosa. The first thing you’ll learn is that it’s still not clear whether it’s better to operate like a skeptic rooted in Doubt or to trust your instincts and move forward with Conviction. Nor is it certain that your Doubt is always the sign of a curious mind; there may be times your Doubt is strictly a form of uncertainty rooted in madness—your inability to distinguish the real from the unreal, or the truth of things from their illusions. It’s almost as if there’s some terrible, malevolent force at work—guiding you, beckoning you, pulling you forward. And it’s possible that your search for Nigel Engram may take a backseat to your desperate scramble to hold onto whatever shreds of sanity remain to you. And, here, is your Doubt your salvation? Or are you better off following your Conviction? In A Phantom of Truth, these questions matter immensely, and you’ll need to find the right answers, lest you end up a Lost Soul (A Phantom of Truth, 227) in a very foreign land. In addition to its scenario, A Phantom of Truth supplies you with twenty-two player cards (two copies each of eleven different player cards) designed to help you stay grounded and make progress in your campaign. Among these, you’ll find a handful of higher-level cards that recall the familiar, including a couple of fan favorites from the Core Set. One of these is the .45 Automatic (A Phantom of Truth, 190)—a wonderful Weapon to have in hand when you’re beset on all sides by fear and foes. While this powerful handgun has been a Guardian staple since the game’s debut, the two experience points you’ll pay for the upgraded version in A Phantom of Truth are well rewarded by an extra Combat icon, the ability to ignore the retaliate keyword, and by an invaluable one-point boost to your Combat with every shot you fire. All of which may be handy should you find yourself stalked by strange, winged Monsters in the Gardens of Luxembourg . 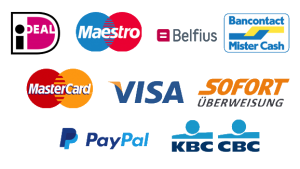 For your experience points, you are rewarded with the Fast keyword, which immediately gives you an action for your troubles. Next, you gain an extra Agility icon. While this Agility icon won’t likely benefit you much the first time you draw your Pickpocketing—since you’ll most likely want to put the Talent into play—the extra icon on your second copy of Pickpocketing could easily prove the difference between the success or failure of a critical evade attempt. 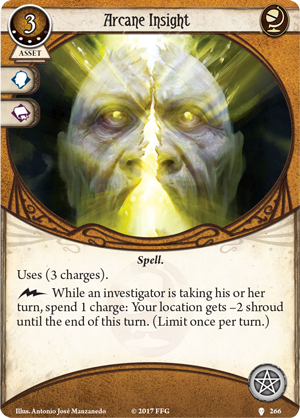 Together, these newly upgraded cards represent just one of the many different ways you might spend the experience you gain during The Path to Carcosa campaign, but it’s one that might appeal to those investigators who are either already meeting with great success—as well as those who have been severely terrified and traumatized by all they have seen. Your trip to Paris is fated to be eventful, but will you find the man for whom you’re looking? Or will someone—or something—find you instead? 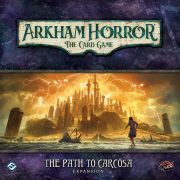 Fantasy Flight Games is proud to announce the upcoming release of The Pallid Mask, the fourth Mythos Pack in The Path to Carcosa cycle for Arkham Horror: The Card Game! 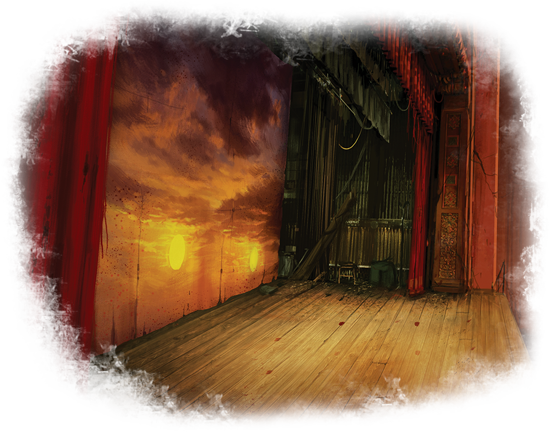 In The Pallid Mask scenario, you and your fellow investigators will enter these tunnels in search of a stranger whom you believe must be connected to the events surrounding the performance of The King in Yellow at the Ward Theatre in Arkham. But with each new strange twist and turn, you’ll find yourselves only stepping deeper into mystery. Perhaps you can follow the tunnels all the way to the pulsing heart of the play’s mysteries, but there’s a chance, too, you’ll simply find yourselves lost amid the shifting landscape. What begins as a trek through moist and clammy tunnels of stone may become a journey that leads you under the earth, through The Gate to Hell, and straight to your demise at the Well of Souls or some other forgotten chamber. Destined to be a fan-favorite, the scenario from The Pallid Mask utilizes the game’s locations in a novel way, bringing them into play only as you travel through them, and arranging them in a constantly shifting and unpredictable fashion. Each new step through these labyrinths could be your last. Pre-order The Pallid Mask at your local retailer or online through our website today, and read on for more information! 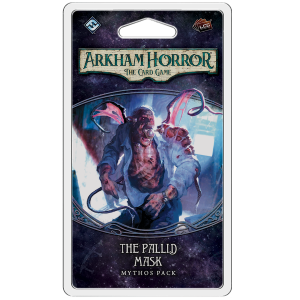 Additionally, the sixty new cards from The Pallid Mask include two copies each of twelve different player cards. 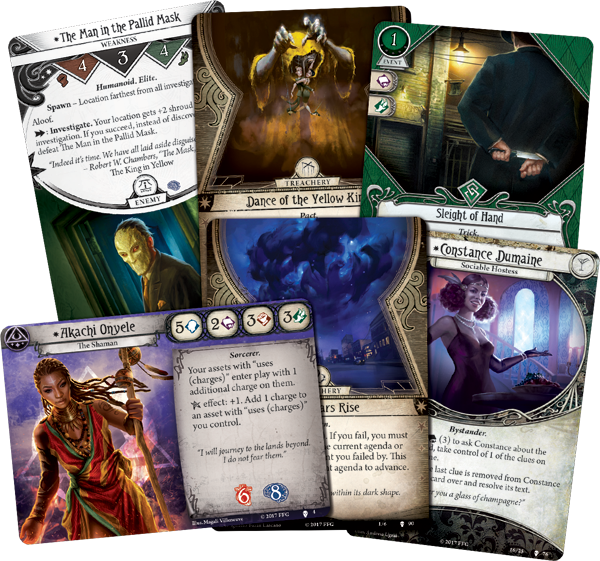 Divided between the game’s five different investigator classes, these feature several higher level versions of existing cards alongside a range of new skill cards that offer potent kickers. Draw a card, ready an exhausted ally, gain resources, or offer sacrifices to increase your skill card’s value. In the unpredictable subterranean darkness of The Pallid Mask, could these skill cards be what ultimately prevents your demise? 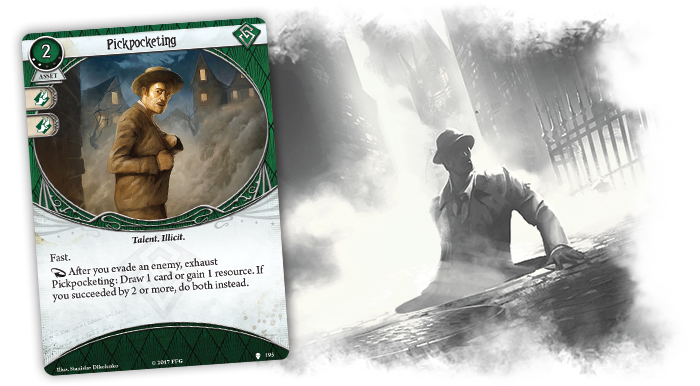 When you’re ready to head beneath the Parisian streets and explore the deadly catacombs of The Pallid Mask, you’ll set aside a handful of the Mythos Pack’s new Catacombs cards, including the one you ultimately hope to discover. You’ll shuffle these cards and place them at the bottom of your Catacombs deck. Then you’ll place your starting location, marking it with a resource, and you’ll shuffle the remaining Catacombs locations to place atop the others. 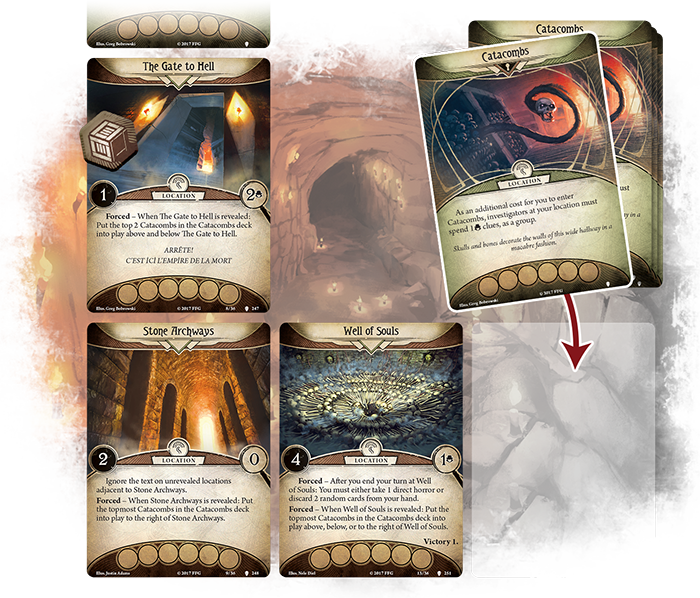 This is how you form your Catacombs deck, but the truly interesting part of The Pallid Mask is how the Catacombs deck transforms its new scenario into an adventure full of deadly pitfalls and frightening discoveries. Instead of laying out a whole network of locations at the beginning of your game, you’ll place only a single location onto the table—the one through which you enter the Catacombs. Then, throughout the adventure, each time you reveal a new Catacombs location, you’ll discover new passages that lead deeper into the tunnels. Depending which location you enter, you may find yourself placing a single unrevealed Catacombs location to its right, or possibly above it. Or below it. Or to its left. Or you may find that your position branches in multiple directions. Given the unpredictable nature of your journey through these Catacombs, The Pallid Mask introduces a unique set of scenario-specific rules stating all orthogonally adjacent locations (directly to the left, or right, above, or below each other) are adjacent for the purposes of travel. And this means that you’ll never know what to expect as you set foot in a new location. With all its physical dangers—plus an array of untold supernatural threats—the scenario from The Pallid Mask is no place for rookie investigators. It’s easy to get lost. It’s just as easy to be lost forever, dragged down into sudden pitfalls by raving Lunatics, grotesque Monsters, or other Terrors. As a result, you’ll want to have earned and spent every possible iota of experience to upgrade your deck and increase your chances of survival. 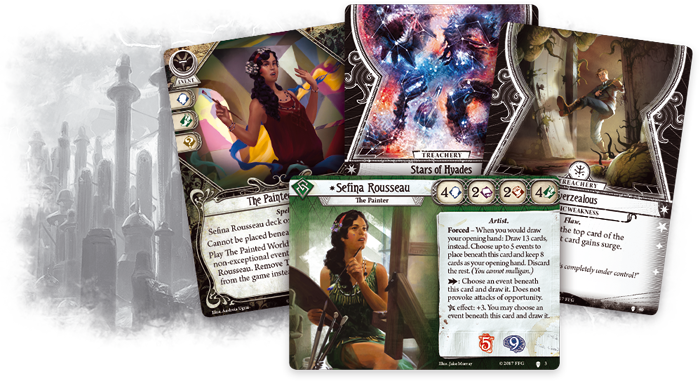 The new player cards in the Mythos Pack feature a split between higher level versions of existing cards and new skill cards, all of which come with a potent kicker. 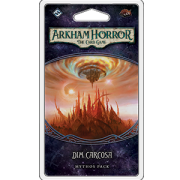 By the time you start to explore the scenario’s Catacombs, if your journey through The Path to Carcosa campaign has been mostly successful, you might wish simply to upgrade your cards, rather than introduce larger changes to the composition of your deck. Or perhaps you simply find yourself gravitating toward the Ritualist archetype we outlined in the article, “That Which Doesn’t Kill Us…” Either way, you’ll find a number of valuable upgrades in The Pallid Mask, such as the new version of Emergency Cache that can help you quickly refresh your most important supplies. 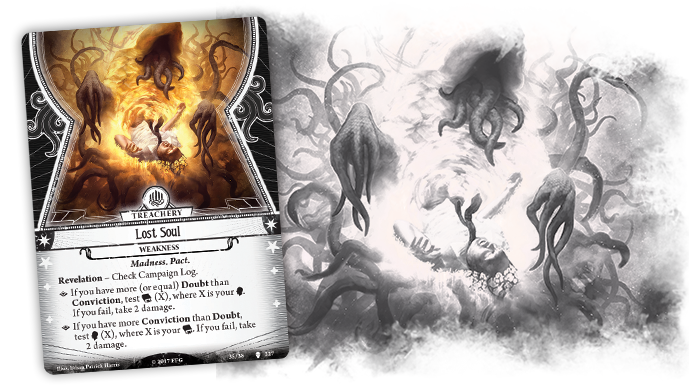 On the other hand, if you’re pursuing new paths—or flailing about for anything that might get you a better handle on your remaining sanity—you might want to play with the Mythos Pack’s new skill cards. 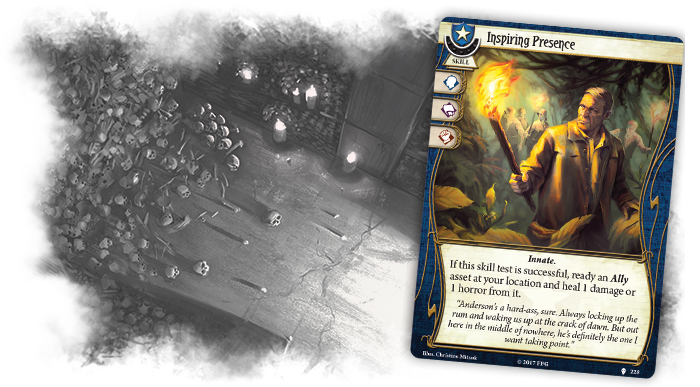 As with Inspiring Presence, each of these skill cards offers multiple icons and a valuable kicker that might very well make the difference between successfully navigating these eerie tunnels and being lost in them forever. There are layers upon layers of darkness in the catacombs beneath Paris. Within that darkness, though, you may find the clues that will begin to shed light upon the mysterious play, The King in Yellow. You may finally learn how the play is connected to the atrocities that follow it from city to city… But you should be careful what you choose to uncover. 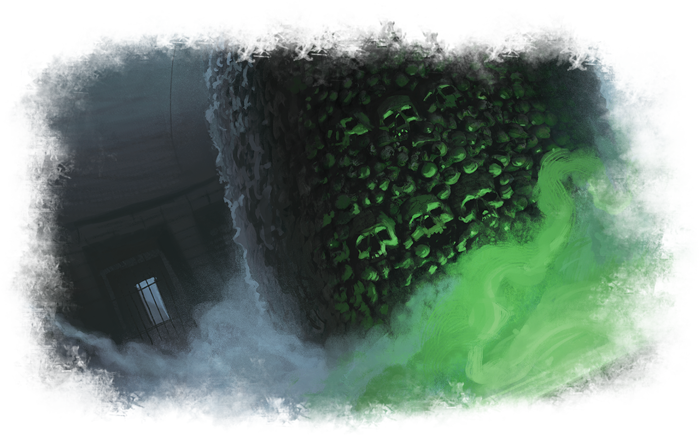 Traps, monsters, and branching corridors—what else will you find in the subterranean world of The Pallid Mask? You have had cause to doubt your sanity before. The choices you’ve made along your path have been questionable, at best. Can you be sure that you’re seeing reality? If you can still think logically, you may apply Occam’s Razor. Surely it is far simpler to believe that you have gone insane rather than supposing that the entire world is slowly falling under the sway of a dark god from another dimension. Of course, it’s far too late for you at this point. The storm is brewing and bursting above your head, with pelting rain coming down from above and the tide inexorably rising from below. As your tiny steamer takes you out to the island monastery of Mont Saint-Michel, there’s no turning back for you. Make no mistake by letting yourself fall into hope as you approach the island. No matter how grim things have looked in the past, you’ve always had the act deck—a singular flicker of light in even the darkest hours. 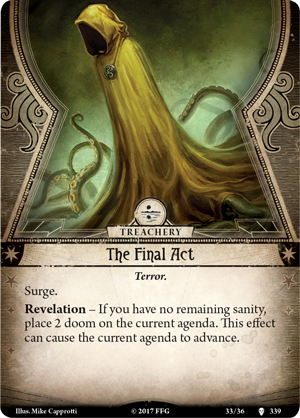 The act deck holds an implicit promise: if you can find a way to advance through the act deck, you have a chance to survive. Things could turn out alright in the end. With Black Stars Rise, your madness reaches new depths. There is no act deck, nor any light in the darkness. 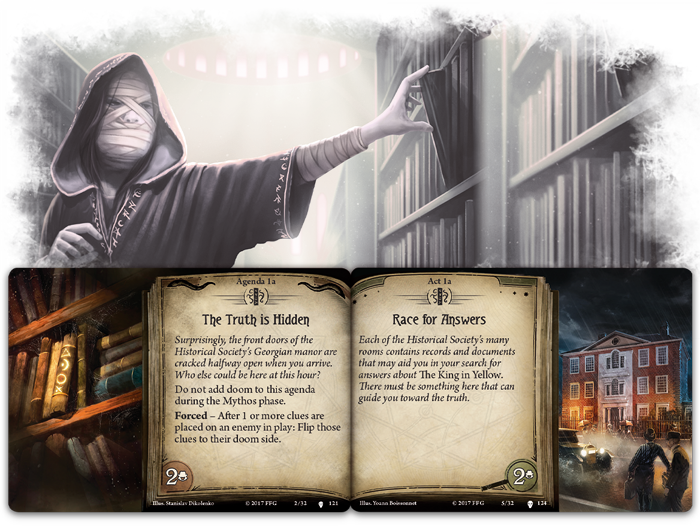 At the beginning of the game, you’ll set up one agenda deck as normal—and in place of the act deck, a second agenda deck. The first agenda deck represents the rising tides and flood waters smashing against the sea walls. 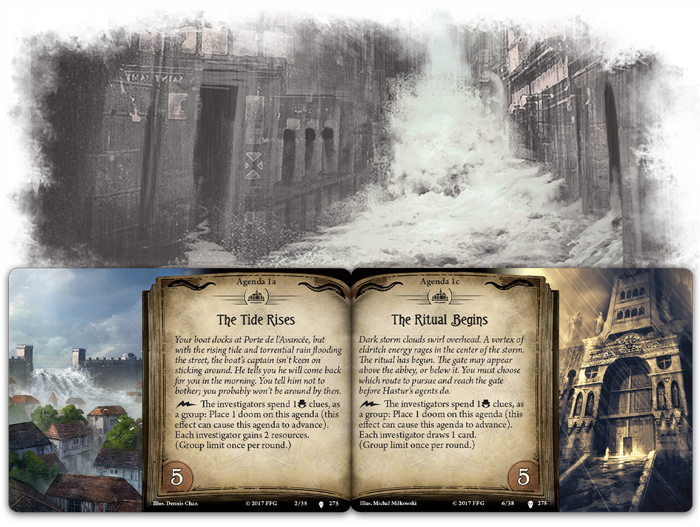 The second agenda deck corresponds to the monstrous storm lashing the island, its clouds coruscating with eldritch energy. Nothing remains for you, except to choose how you and your friends will meet your demise. And even if you could somehow find a path through the madness and the gate to Carcosa, the floods or the storm would surely destroy you before you could reach it. For you and your fellow investigators, few things push your sanity further to the limit than the Spells that you use to toy with uncanny powers far beyond your control. At any moment, these barely-understood incantations could slip away from you, lashing your mind with horrors or unleashing fresh demons upon the world. 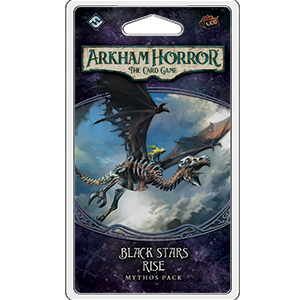 It’s fitting, then, that as Black Stars Rise draws the tattered robe of insanity close about your shoulders, it delves deeply into Spells. Traditionally, Spells have been the purview of the Mystic class. Still, as Lost Carcosa pushes closer to Earth, Arcane Insight can spill over into the minds of even the uninitiated, pulling back the shroud of this world and revealing clues that would have gone unseen. Rogues, on the other hand, may find that their natural powers of misdirection and Suggestion have been amplified, giving them a tool to avoid attention and slip away from even the most dogged pursuers. Mystics do not go wanting either. The surplus of unnatural, otherworldly energies washing over the world has created a surplus of new converts, such as the upgraded version of Arcane Initiate. The horrors these young Sorcerers have seen—and perpetrated—have brought more doom on the world or pushed them to the brink of insanity themselves. But their skills may be sufficient to bring you the Spells that you need to buy a few more moments before you inevitably succumb to the suffocating control of Hastur. The power of these Spells is undeniable—but their very power pushes you farther into your doomed spiral… into the realms of madness. These Spells cannot create a path forward where none exists. They will not conjure an act deck out of nothingness to lead you into Carcosa. But perhaps, in spite of everything, you will continue to struggle onward. Perhaps you will say, in the words of the Survivors, “Not without a fight!”. There is no escape. You are doomed. In the realm of lost Carcosa, where black stars hang in the heavens, all truths will come to light beneath the fires of the suns. Fantasy Flight Games is proud to announce the upcoming release of Dim Carcosa, the sixth and final Mythos Pack in The Path to Carcosa cycle for Arkham Horror: The Card Game, available for preorder now at your local retailer or online through our website! 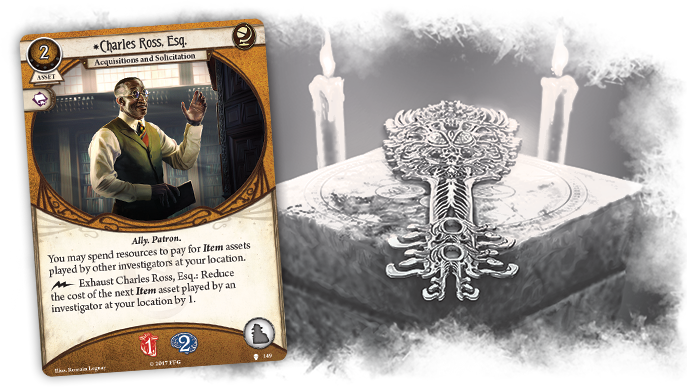 Your investigation into the mysterious play The King in Yellow has led you through a maddening series of events, from the darkest corners of Arkham Historical Society, to twisted halls of the asylum, and even the catacombs of Paris. It has all led you here, to dim Carcosa, a place beyond all imagining. A warped, alien city lies before you. Its twisting streets and aberrant architecture have no semblance of order or structure. In the distance, a murky lake reflects the glare of two suns. This is Carcosa—the realm of madness in the stars, where Hastur reigns supreme. As the final act of the Path to Carcosa cycle, Dim Carcosa is filled with empyrean madness both beautiful and terrible. 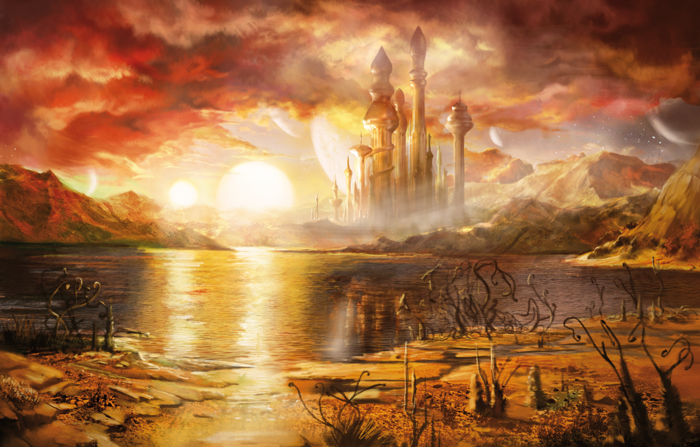 The once grand city stands in ruins, the remains of some accursed place that defies any sense or reason. 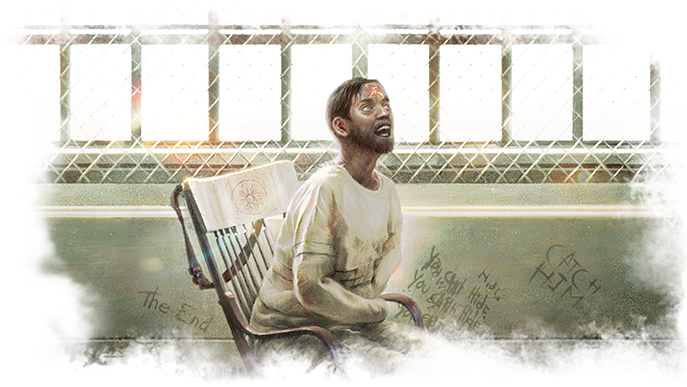 In the middle of this madness you stand alone as the last defense for Arkham… and the world. 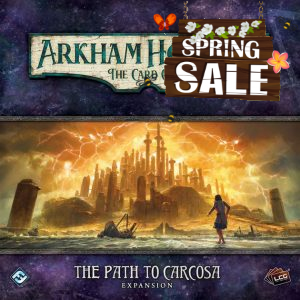 If you wish to survive this journey into madness, you must learn as much as you can about this strange realm and make sure that you leave No Stone Unturned (Dim Carcosa, 307), searching your player deck for any one card that may prove useful and adding it to your hand. You may have doubted your sanity before, but now you see that it was true. Everything—it was all true. But now that you have found your answers, will you be strong enough to put an end to The King in Yellow’s dark design and find a new ending? Your time is running out. Even as you explore the Ruins of Carcosa (Dim Carcosa, 327), you become weak, taking damage as your investigation progresses. Your only hope for survival is to return to your own world. Yet somehow, you feel as if your fate is no longer under your control. Your story progresses with each location you discover, almost as if you are not acting under your own will. Each of the locations in the Dim Carcosa scenario have no unrevealed side. Instead, their reverse sides bear story cards. Trapped in a dim, distant realm, you will find few allies. But amongst the city’s remains, you may encounter one of the its dwellers, an Inhabitant of Carcosa (Dim Carcosa, 327), to aid you as the script demands. The man cries and raves, telling you more of the ancient and famous city. Though his words have little meaning to you, deep within your mind, you begin to understand. Dim Carcosa is fraught with dangers. You can desperately empty your ammo into your enemy, forcing them to “Eat Lead!” (Dim Carcosa, 304), but even this may not save you from the horrors that await you in lost Carcosa. In the moment of your demise, you may be lucky enough to Cheat Death (Dim Carcosa, 310), escaping the enemies surrounding you. But leaving combat alone would only buy a few sweet moments of life. Instead, this powerful Trickallows you to discard all cards in your threat area, heal two horror and two damage, and move to any revealed location where no enemies await you. This saving grace provide the opportunity you need to regain your strength and finish the seemingly impossible task before you. 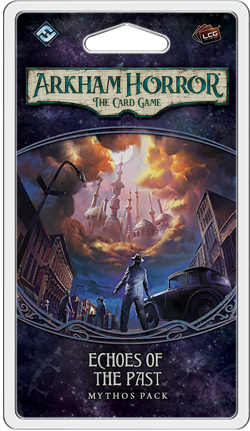 But the question remains: are you the master of your own fate, or are you simply a puppet of Hastur? What will become of you once your part has been played? In the lost realm of Carcosa, insanity is inevitable as the two suns that light the city burn madness into your mind. But even with your mind fractured and broken, your investigation does not end here. In Dim Carcosa, you are not defeated when you have horror equal to or greater than your sanity. Sometimes madness is the best response when confronted with an impossible reality. During your stay in Carcosa, you may continue to take horror in excess of your sanity, in which case your remaining sanity is considered zero. On the surface, this may appear to be a blessing, but it may also prove a curse as you move towards The Final Act (Dim Carcosa, 339). When this encounter card is revealed, you must place two doom on the current agenda if you have no remaining sanity, perhaps pushing it to advance. 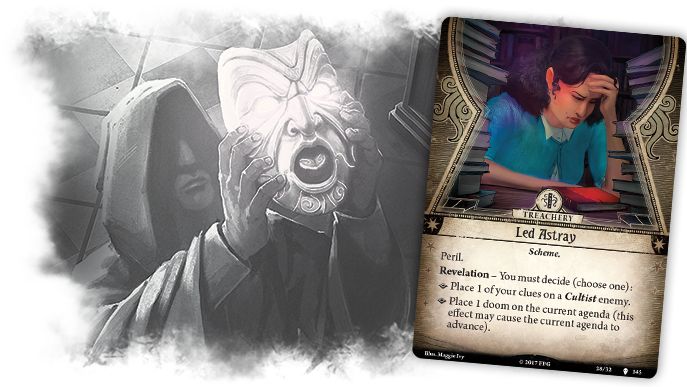 Other consequences of a broken mind may come about in battles, forcing you to fail skill tests and depriving you of elder sign effects. When your mind becomes the playground of Hastur, you will find yourself bending to a will that is not your own. Forced to battle your own mind in a world you do not understand, will you be able to end the madness and return, or will you become another lost soul? 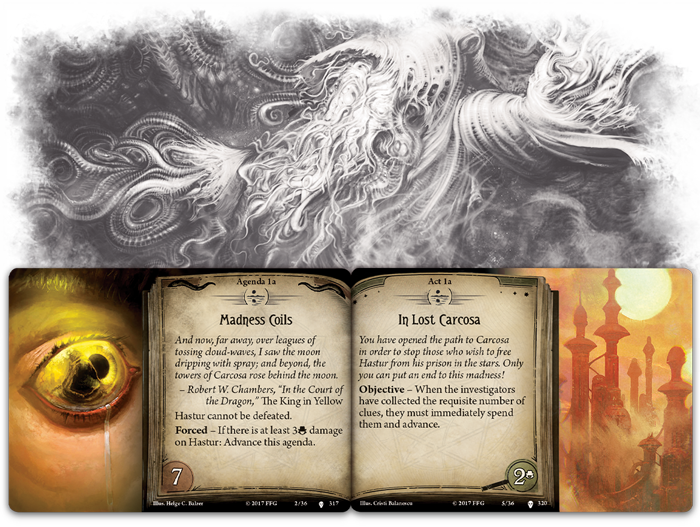 Travel to the realm of madness beyond the stars and take on The King in Yellow before your time and sanity run out. This is your final act and your curtain is about to fall.